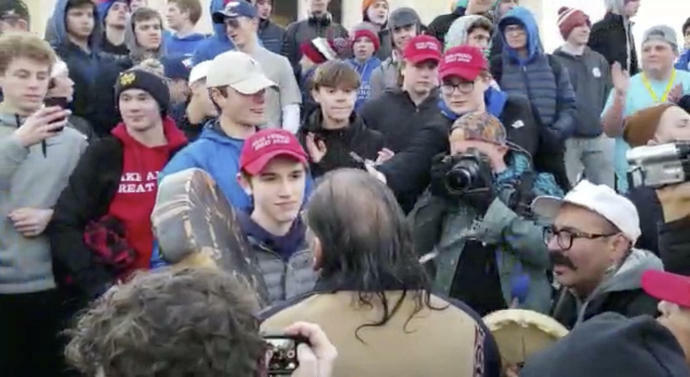 DETROIT (AP) -- A Native American who was seen in online video being taunted outside the Lincoln Memorial said Sunday he felt compelled to get between two groups with his ceremonial drum to defuse a confrontation. Nathan Phillips said in an interview with The Associated Press that he was trying to keep peace between some Kentucky high school students and a black religious group that was also on the National Mall on Friday. The students were participating in the March for Life, which drew thousands of anti-abortion protesters, and Phillips was attending the Indigenous Peoples March happening the same day. "Something caused me to put myself between (them) - it was black and white," said Phillips, who lives in Ypsilanti, Michigan. "What I saw was my country being torn apart. I couldn't stand by and let that happen." Videos show a youth standing very close to Phillips and staring at him as he sang and played the drum. Other students - some in "Make America Great Again" hats and sweatshirts - were chanting, laughing and jeering. Other videos also showed members of the religious group, who appear to be affiliated with the Black Hebrew Israelite movement, yelling disparaging and profane insults at the students, who taunt them in return. Video also shows the Native Americans being insulted by the small religious group as well. The U.S. Park Police, who have authority for security on the Mall, were not taking calls from media during the partial government shutdown. "We extend our deepest apologies to Mr. Phillips," the diocese statement read. "This behavior is opposed to the Church's teachings on the dignity and respect of the human person." As of Sunday morning, Covington Catholic's Facebook page was not available and its Twitter feed was set to private. Calls to the school went unanswered Sunday. According to the "Indian Country Today" website, Phillips is an Omaha elder and Vietnam War veteran who holds an annual ceremony honoring Native American veterans at Arlington National Cemetery. Phillips said it was a difficult end to an otherwise great day, in which his group sought to highlight injustices against native people worldwide through marching and prayer. He said his first interaction with the students came when they entered an area permitted for the Indigenous Peoples March. "They were making remarks to each other ... (such as) 'In my state those Indians are nothing but a bunch of drunks.' How do I report that?" he said. "These young people were just roughshodding through our space, like what's been going on for 500 years here - just walking through our territories, feeling like 'this is ours." Nearby, the black religious activists were speaking about being the only true Israelites. Phillips said group members called the Native Americans "sell-outs." Marcus Frejo, a member of the Pawnee and Seminole tribes who is also known as Chief Quese Imc, said he had been a part of the march and was among a small group of people remaining after the rally when the boisterous students began chanting slogans such as "make America great" and then began doing the haka, a traditional Maori dance. In a phone interview, Frejo told the AP he felt they were mocking the dance. During the incident, Phillips said he heard people chanting "Build that wall" or yelling, "Go back to the reservation." At one point, he said, he sought to ascend to the Lincoln statue and "pray for our country." Some students backed off, but one student wouldn't let him move, he added. Although he feared the crowd could turn ugly, Frejo said he was at peace singing despite the scorn. He briefly felt something special happen as they sang. Eventually, a calm fell over the gathering and it broke up. The private school's website describes its mission as being "to embrace the Gospel message of Jesus Christ in order to educate students spiritually, academically, physically and socially." Associated Press writer Lisa Cornwell in Park Hills, Kentucky, contributed.